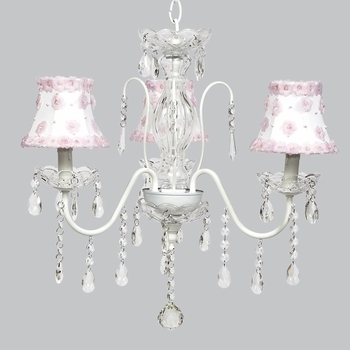 The white 3 arm jewel chandelier lends sophistication and elegance to your room. The lighting fixture has a glass center is surrounded in dangling crystals. The white petal power shades make a great accent. A perfect size and addition for a girls room. This item is custom made for each order and ships directly from the designer. Please note: custom made or custom ordered items are non-returnable. *At this time, we are offering Complimentary Ground Shipping on all Jubilee Lighting Orders. Please enter coupon "freeship" at checkout.